Now, convert all your favorite music and video to iPod with 4Media iPod Video Converter. This iPod touch converter can convert iPod video from diverse videos like AVI, MPEG, WMV, MOV, RM, RMVB, ASF, VOB, 3GP, H.264/MPEG-4 AVC video. It is also an iPod music converter to convert audios like WAV, WMA, MP2, AC3, RA, OGG, CDA and APE to iPod MP3, M4A and AAC. 4Media iPod Video Converter provides the function to transfer converted files to iPod directly after converting. 4Media iPod Video Converter has introduced NVIDIA CUDA and AMD APP technology, making video conversions 5x faster. Click here for details. All of the output iPod files work well with all iPod models: iPod touch, iPod nano, iPod classic and iPod shuffle. 4Media iPod Video Converter can be iPod touch video converter, iPod nano video converter, iPod shuffle music converter, etc. Moreover, this great iPod converter provides more features like file split, batch conversion, and preview that you can expect. More than a iPod video converter, this iPod converter can also convert those video files to audios such as MP3, WAV, M4A, AAC and AIFF if you like the background music of the videos. 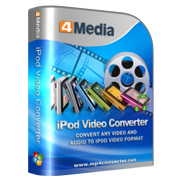 This iPod touch video converter also supports converting popular audios like MP3, WAV, M4A, AAC and AIFF to iPod MP3, M4A and AAC audios. CD decoding is supported. 4Media iPod Video Converter supports automatically detecting CPU. Each task is processed with multi-core to reach the highest speed and promote the best performance. NVIDIA CUDA & AMD APP technology is Enabled which can accelerate the converting speed to 5X faster. As great iPod video converter, it provides basic and advanced parameters for beginners and experienced users. After adjusting the parameters of a profile, you can save it as a new one. This iPod nano video converter can split a video file into pieces of proper size with selectable time length or file size available to fit your iPod better. Bitrate Calculator gives you the ability of customizing file size to get the output file with the size you want. With the iPod touch video converter, you just need to type the start time and approximate duration of the video segment for converting and then get the segment. Large numbers of profiles or formats you can choose for the same file to convert at the same time. It's timesaving to get multiple format files for the same source at one time. This iPod nano/iPod touch video converter supports batch conversion and multithreading to get the files converted one by one to convert iPod movie efficiently. 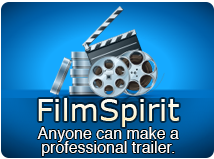 Provides you with a built-in resizable player to preview the movie and find some favorite movie scenes, you can take a snapshot and save as BMP file. Immediatly transfer output to devices like iPhone, iPod and etc. Run it in background to possess less space. After done action releases you from the long time waiting for the conversion. Interface languages to choose: English, German, French, Spanish, Japanese and Chinese in the iPod touch/nano video converter. Support running the program in the background for your convenience. Improved the usability for profile customization. How to convert videos in other formats to iPod movie MP4? How to convert AVI, MPEG videos to iPod MP4 format?